If you have difficulty locating Synergistic Research at a show, look for the most well-dressed audiophiles on the planet. I have to say, these guys are very patient and easygoing and at the same time very confident about their offerings. Andy Wiederspahn of Synergistic Research gave me a tour of their many products. Moving across the line of gear, you’d think these were created in the distant future. Aside from appearance, what they claim these components are capable of doing for your sound system will absolutely convince you that these products were indeed teleported from the future into modern day. I was blown away by how their passive acoustic panels and HFTs were able to interact with the room via the Atmosphere XL4. From a touch of a button on an iPad, the acoustics in the room were drastically transformed. Not to mention the markedly improved bass response with the three passive Black Boxes in the room. I suspect these devices might not work well in all rooms because every space is different. Obviously, sounding different doesn’t mean it sounds better but the fact you could tune the waveforms directly via passive devices on a handheld tablet…that’s just nuts. Anyway, I was there for the live demo and thought the products had merit and will be something worth looking into. 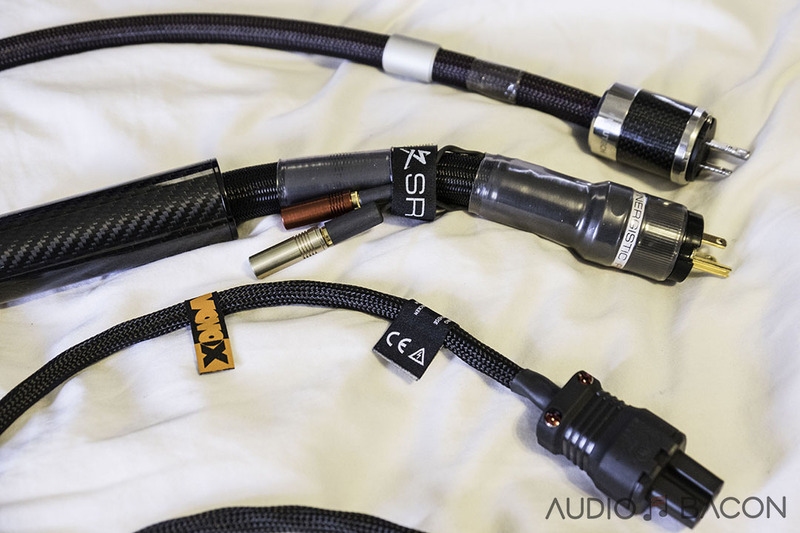 Months later, a local audiophile buddy brings over a Synergistic Research Atmosphere UEF Level 3 power cord ($3,395). I had no clue how much it costs or what it was made out of. I was just glad it didn’t come with a wall wart (many of SR’s previous products had an active shielding module that required an external power unit). I’ve gone over the importance of quality power and what goes into the design of a power cord so let’s get right to it. 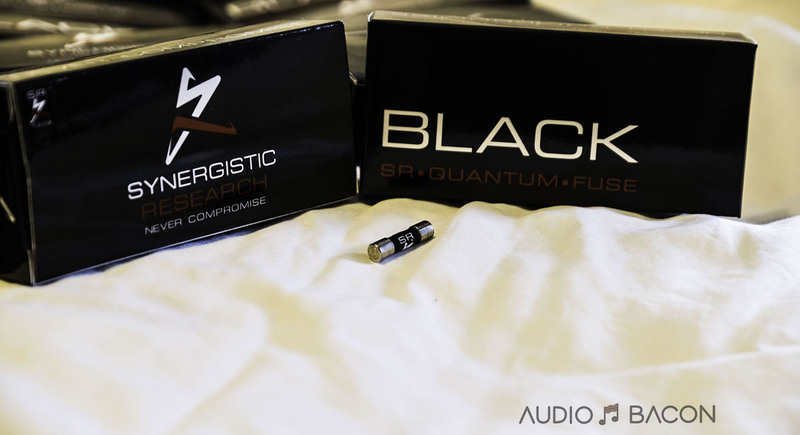 After listening to the Atmosphere Level 3 power cord, I received a few samples of the BLACK Quantum fuses as they supposedly synergize well with the various Atmosphere products. The “superconductor” graphene is used in both the BLACK Quantum fuses and Atmosphere UEF Level 3 power cords. Graphene is the most conductive material on the planet. Its current density is a million times greater than copper. It is one atom thick and is the thinnest material on earth. There’s even a graphene-based headphone. 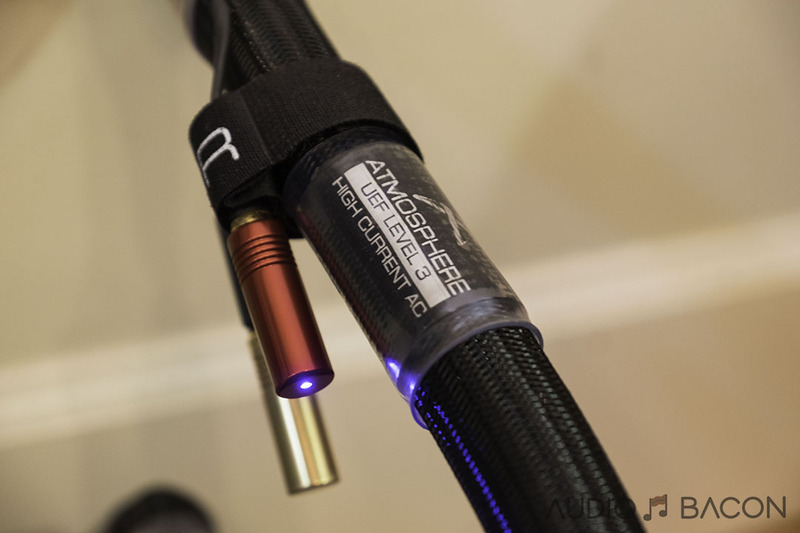 The 10-gauge Synergistic Research Atmosphere UEF Level 3 is the world’s first power cord to implement graphene. Embarrassingly enough, replacing fuses didn’t even cross my mind until recently. All power has to traverse these fuses so their impact on the sound of your components shouldn’t be underestimated. Any noise that goes through the cable or electrical components will also be realized in the fuse. These BLACK fuses are Synergistic Research’s 3rd generation of fuses and require anywhere from 100-400 hours of break-in. Although they start sounding quite good at around the 100-hour mark on our systems. At Synergistic Research we’ve isolated key factors that affect how electricity propagates by changing the behavior of electrons through Inductive Quantum Coupling methods we collectively call UEF Tech. In fact, UEF Tech is so powerful even an electrical chain several miles long is fundimentally improved with nothing more than a single fuse engineered with our patented UEF Technology. 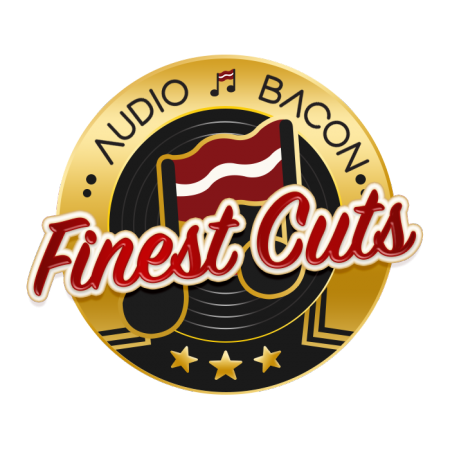 Once the burn-in was finished (100-200 hours), we started by replacing the fuses on our PS Audio BHK Signature preamp and 250 Signature amplifier. Please keep in mind the direction of the fuses matter and you won’t know which orientation is correct until you listen. So there’s a chance we might’ve burned them in incorrectly but we’re guessing it still helps nevertheless. Swapping six fuses inside the PS Audio 250 amplifier was a bit tedious but it wasn’t too difficult to find the correct orientation. The more detailed and focus the sound is, that’s the proper orientation. If there’s any bleeding or fuzziness, swap positions. 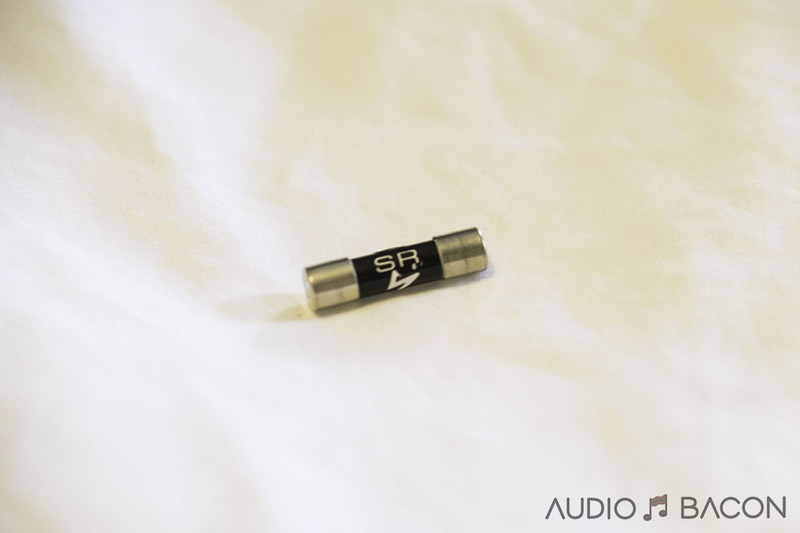 SR’s products tend to be more spacious sounding than most. It extended the soundstage depth, width, and height enabling the sound music traveled deep and naturally within the listening room. It didn’t take long to realize we had to replace ALL our fuses. 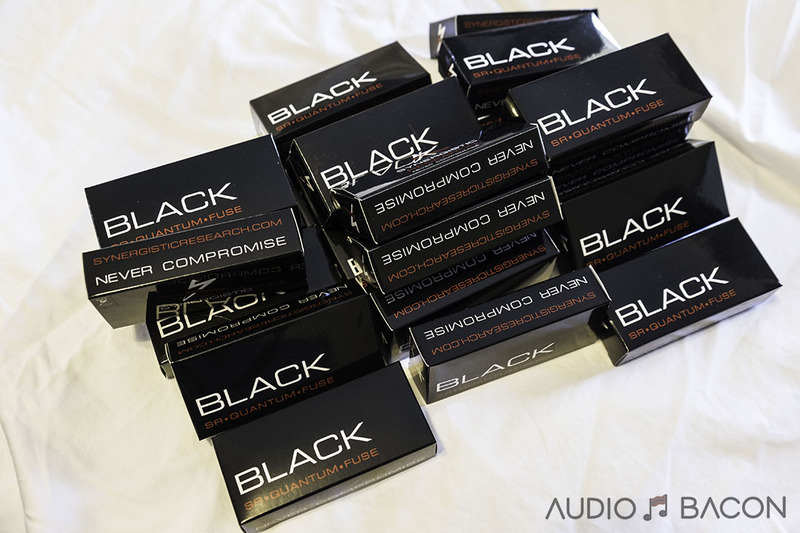 So we did the only logical thing and purchased 22 BLACK Quantum fuses for all our listening rooms. These BLACK Quantum fuses provided the most sonic dividends on investment of any product we’ve tried. It is the cheapest but most impactful upgrade we’ve had on our systems. If there’s anything that proves the importance of quality power, this would be it. Try em out, burn em in, and you won’t be returning them. So what happens when we add an Atmosphere UEF Level 3 power cord into the mix. When a component is introduced into a setup, sometimes you’ll have to rearrange a few things, including your speakers, to get the proper sound. Proper speaker placement should be done first to ensure a fair evaluation. Moving your speakers just a few centimeters could change the tone and focus for the worse or better. Some of Synergistic Research’s components require hundreds of hours of break-in. Otherwise, they’ll be a bit thin and hot. We had two Atmosphere UEF Level 3 power cords to experiment with. We still need to try a few more permutations but having two in one system seems to be too much of a good thing. Of course, it’s system dependent and we preferred to have a single Level 3 from the wall to the Equitech power conditioner. This arrangement seems to trickle the benefits down to all the other components in the system. Going against the grain a bit but we preferred the cable without the gold bullet for most of our listening. We just found it to be more musically…rounded. Break-in: The Level 3 power cord requires 300-500 hours of break-in. Carbon fiber housing for the active shielding is quite beautiful. It does make the connector heavier at the outlet so keep that in mind. Although cords stay behind the rack, I appreciate the level of workmanship and attention to detail applied to not just this power cord but to all of SR’s products. Most slap on sleeving and some Furutech connectors and call it a day. This level of care is also shown in their responsive website design, which is the best I’ve seen in this industry. Much more flexible than their previous power cords. UEF 3 Treatment & Quantum Tunneling technology. They have the most comprehensive spec sheet I’ve ever seen for an audio product. Down to the percentage of silver used in their solder and the number of man-hours per cable. I feel they exude a bit of confidence in their tech through this level of transparency. 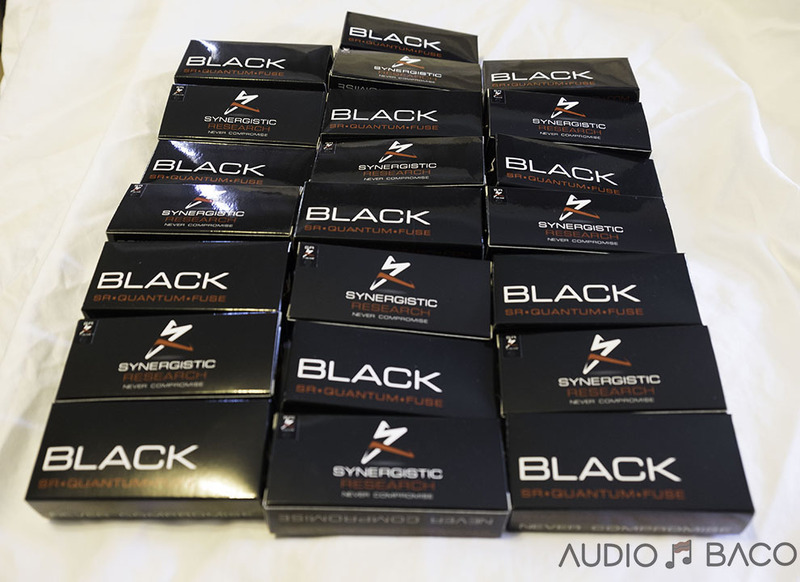 Like many of Synergistic Research’s products, you’re allowed to some flexibility in tuning. The red bullet needs to be connected at all times but the gold bullet allows for tuning. We enjoyed the cable without the bullet for sources and amps but it sounded better with the bullet on for our Equitech power conditioner. 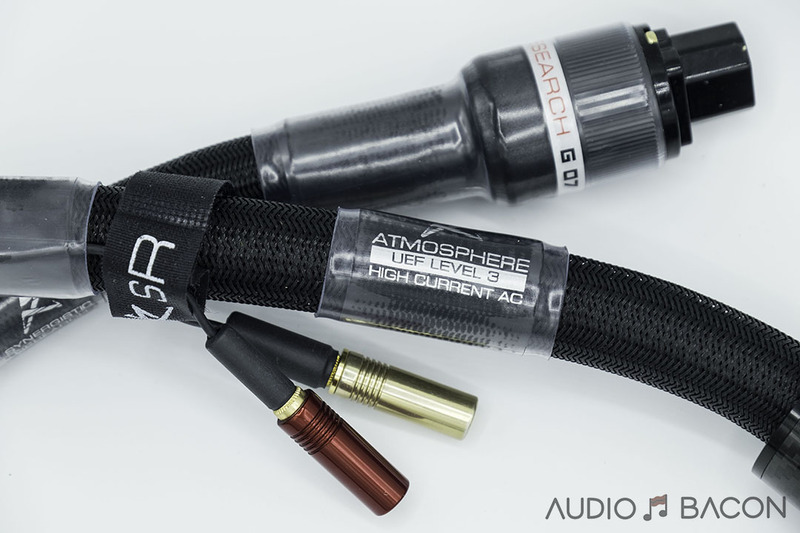 The High Fidelity Cables MC-6 Hemisphere seems to sound better without the gold bullet. YMMV. I slightly prefer the timbre and musical flow of the Shunyata but love the resolution and soundstage of the Synergistic. I think if you preferred the house sound of one or the other, you’ll probably stick with that sound. There’s this greyish and soft overtone with the Shunyata that doesn’t sit well with me. I do find it incredibly accurate and natural but smears over some of the important micro-details. It also doesn’t have close to the amount of refinement and air of the Synergistic. In the end, the Shunyata’s signature sound just wasn’t for me and I gravitated towards the Synergistic. 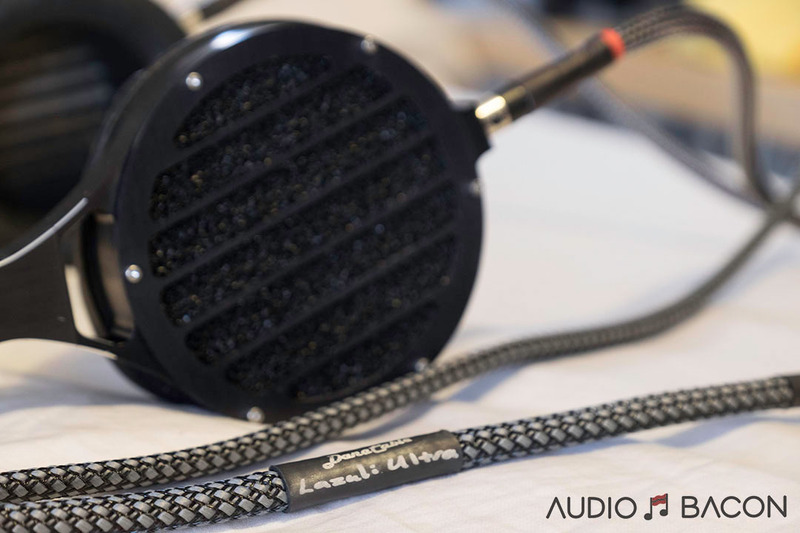 The PAD is the more laid back and relaxed cable while the Synergistic is the more spacious and detailed cable. I feel the Synergistic commands more attention (especially if the gold tuning bullet is used). The SR Level 3 is faster, has a quieter background, and provides the highest resolution I’ve heard from a power cable thus far. The Dominus is more liquid and soft. It doesn’t fade in from black but fades in from a natural and realistic circumambient air. Probably akin to a star track athlete and a professional yoga instructor. Both have their own strengths and weaknesses. I feel the HFC has the right balance between the Shunyata and the Synergistic. Going back and forth between the Synergistic and HFC, I do yearn for the air and layering capabilities of the SR but feel more at home with the HFC’s denser tone, at least for my near-field setup. For our B&W Diamond setup with the PS Audio preamp and amps, the SR Level 3 is king. 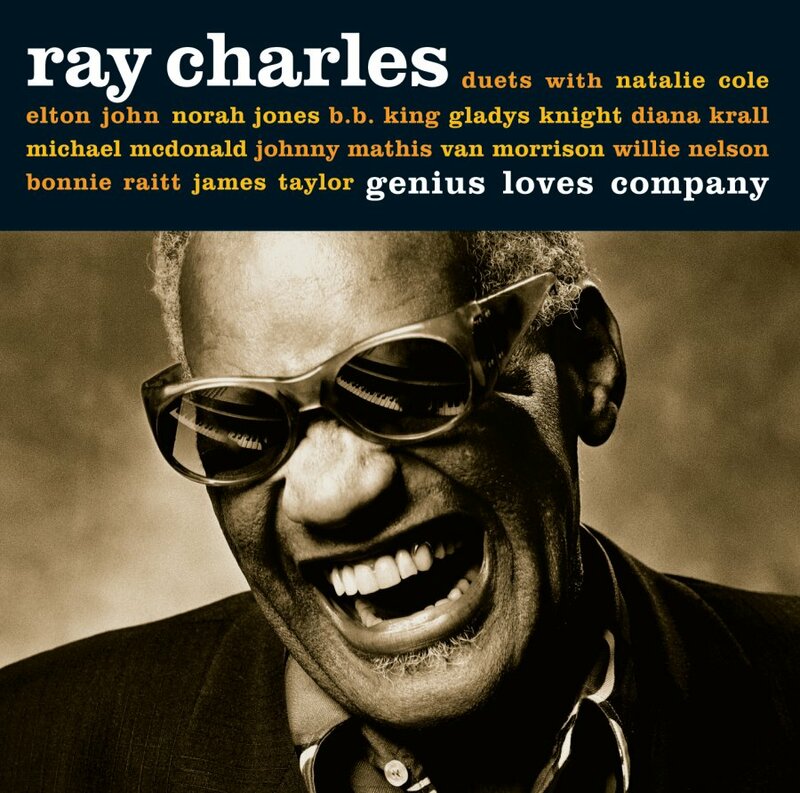 This was Ray Charles’s last studio album and one of my favorite duet albums. I really enjoy the intimate and laid-back nature of this collection. 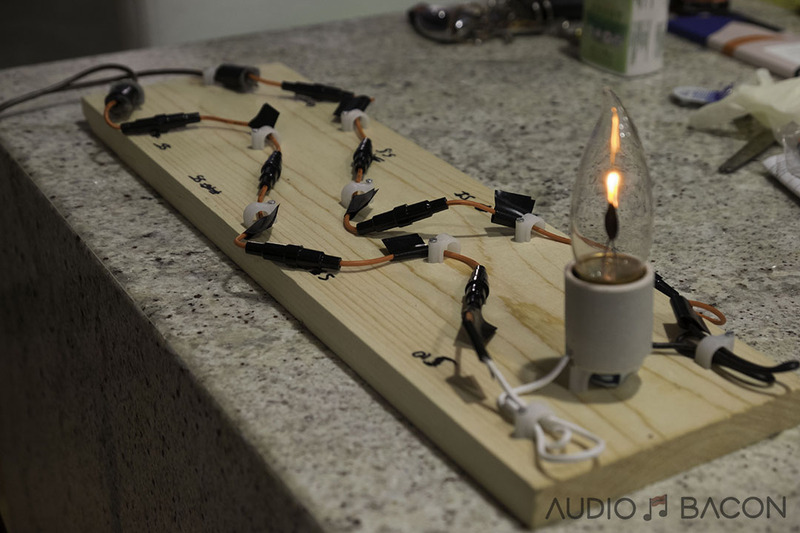 The Atmosphere Level 3 power cord breathes new life into this track. From the textural micro-details of the guitar to the harmonious blend of air and individualism as Ray’s and Bonnie’s voice float back and forth across each other. I’ve also never heard this track with such a quiet background. All voices and instruments just float coherently without a hint of grain or sonic smearing. The Atmosphere L3 also provides a newfound level of spaciousness and transparency to this track. All positives in my book. 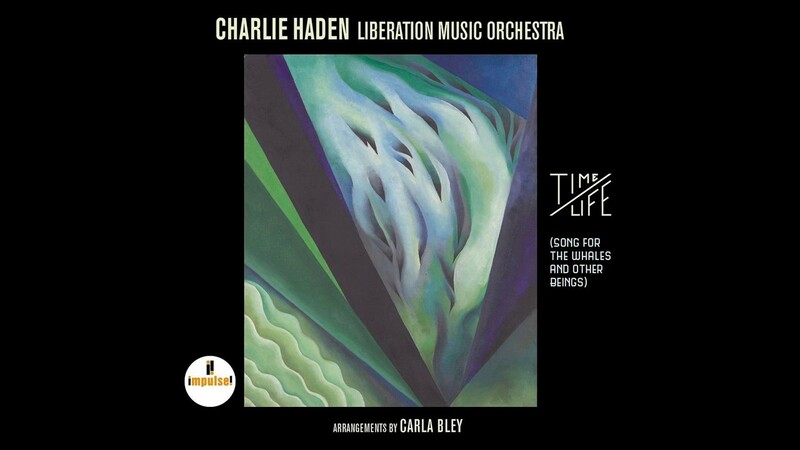 Haden’s solo has never been this well-delineated and resolving. Definitely not as tonally dense as I’m accustomed to but the Atmosphere L3 power cord allows the listener to get visual cues to the vibrancy of his double-bass plucks and emotional insight. I’m also greeted with precise articulation and spatial freedom from the tenor saxophones played by Tony Malaby and Chris Cheek. 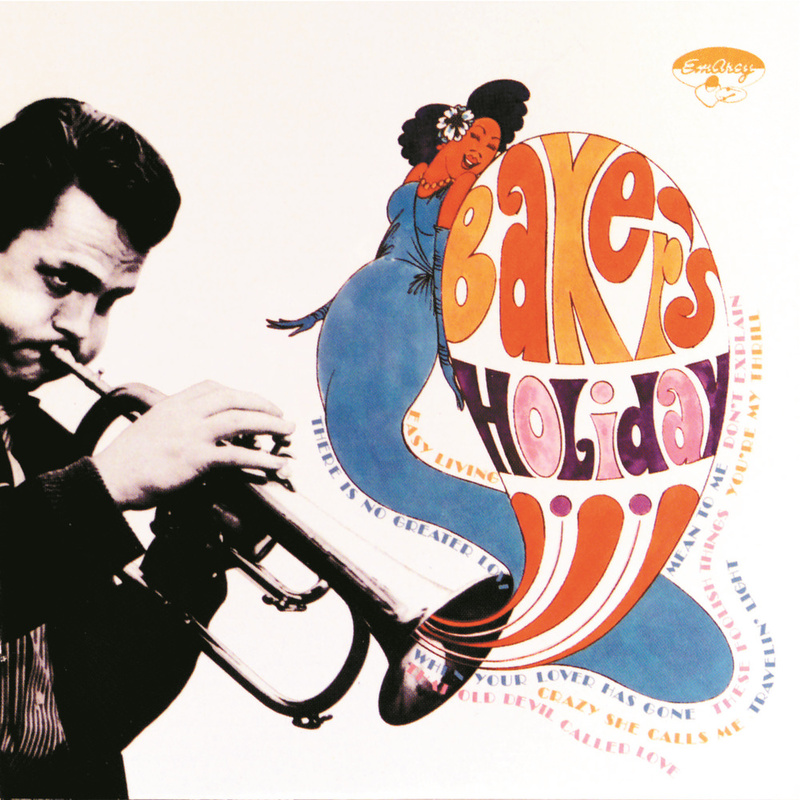 The brass just sings on this track. Drum brushes are everpresent and organic throughout. In fact, the Atmosphere L3 is so resolving, one could actually get a sense of the motion and pressure of the nylon brushes on the drums. Again, I’ve never heard a noise floor this low for a power cord. It helps separate all the players on the stage without losing coherence. One of the most popular Britpop recordings of all time and the third single of this album. This track sounds a bit congested and disoriented on most systems. Given the more leaner tone of the Atmosphere L3, I was expecting it to be on the brighter side of neutral. This is when I realized the power of graphene. Unlike some silver cables (and poor quality copper cables), there’s a smoothness and grip to the presentation with the Synergistic Research. 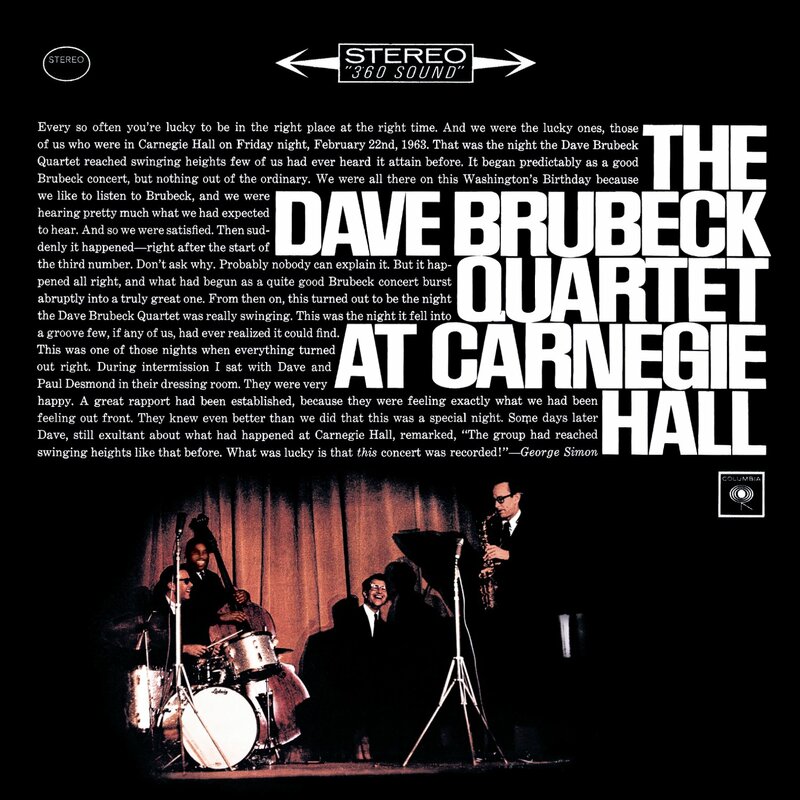 First of all, the quieter background allows the players to be intelligible and provides the drummer, singer, and guitarist with their own acoustic space. It’s never cloudy or abrasive, just super clean and transparent. There’s no doubt in my mind that there’s something very special about this technology. 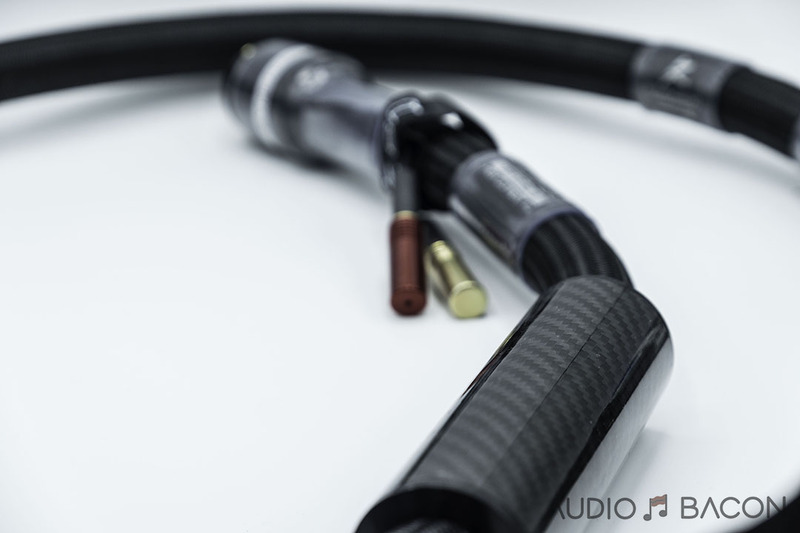 The Atmosphere L3 power cord redefines what resolution is. More often than not, more resolution means a sprinkle of artificialness as well. Whether it manifests itself as some sharpness, distortion, or grain, there’s usually a sonic tradeoff for this precious attribute. With the Synergistic Research power cord, there’s seemingly no heavy tradeoffs. If I were to nitpick, it’s lighter and less intimate than pure copper cables. 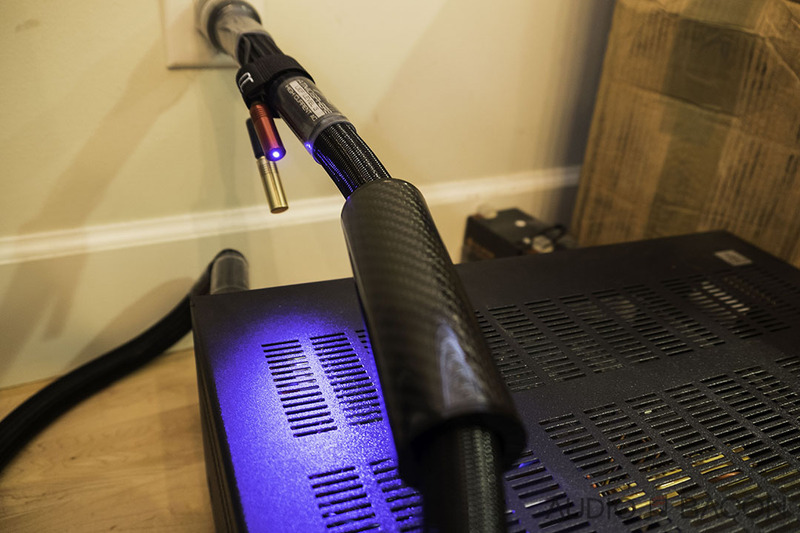 Unlike other “highly conductive” power cords, there’s no sheen over the sax or vocals and it doesn’t sound cold and lifeless. Micro and macro dynamics and details are intact and palpable. I believe this cable has special characteristics and could find a place in any system. There’s an enormous amount of depth and atmosphere, especially for a red book recording. Voices come in from black and are well-focused and layered. Acoustic decays in the recording space are realistically reproduced and are evident throughout. The Atmosphere Level 3 power cord never loses its composure even at the end of the recording where strings start to compete with the choir. It’s somehow able to delineate the violins and shouts so effortlessly with a proper amount of space between the performers. This funky groove has a few veils lifted with the Atmosphere L3. It imparts this clean and rhythmic energy into the drummer, guitarists, and Mr. Wonder himself. I have to admit, this level of resolution without the edginess and grain is addictive and unprecedented for a power cord. Soundstage is expanded, the bass is tight, and strings are convincingly textured. When you don’t want to leave your seat, you know you’re listening to something good. The attack of the drums is done with finesse, tightness, and clarity. The bass, cymbals, and piano at around 6:00 sounds groovy and well-tempered. They all sound like they’re playing synergistically on the same stage. Overall a very fun and involving presentation. If I had to describe the Synergistic Research Atmosphere UEF Level 3 power cord and BLACK Quantum fuses in two words, it would be insightful and liquid. The BLACK fuses were the most transformative component with the highest ROI we’ve ever achieved from a component. I can’t imagine how good their recently released BLUE fuses sound. When I first heard this power cord, my first thought was “silver.” However, it was too smooth to be silver. It didn’t have that distracting, edgy sheen that typically plagues those cables. It also didn’t have this grain I was expecting for the level of resolution I was hearing. It breathes a new kind of air into the music and provides toe-tapping musical enjoyment throughout. Enlarged soundstage and better extension in the lows and highs. 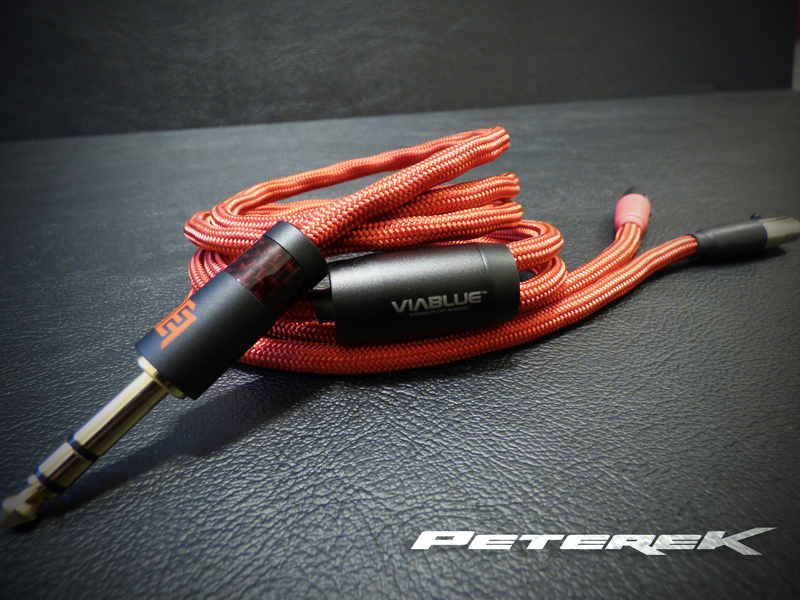 Highest resolution of any power cable I’ve tested. This increased the sense of realism in all recordings. Truly incredible focus and imaging. All other cables sound a bit fuzzy around the edges in comparison. Excels at unraveling micro-dynamics and detail in the music. Accurate spatial portrayal and tonal delineation. Instruments and voices have free reign over their own space and this space accommodates and reverberates in a perceptible fashion. Separation and layering of the acoustic players are done beautifully and convincingly. 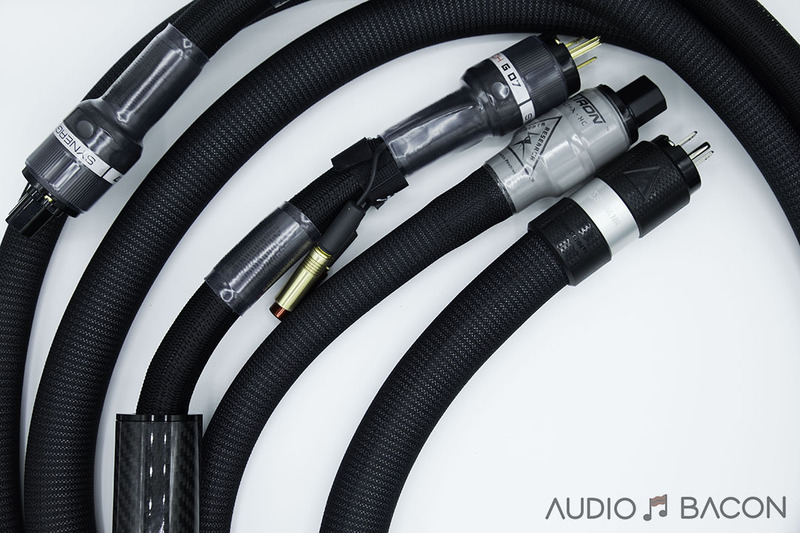 If you think your system is as quiet as it gets, you should try the Atmosphere Level 3 power cord. It is by far the quietest power cable with the lowest noise floor I’ve ever interviewed. Tonally the cable is on the lighter (not really thin or lean) side and doesn’t have the thicker body of most copper-based power cables. This is a natural trade-off. It’ll pair very nicely with warmer gear including high-quality SET amps with a golden bloom. I could see it being a little bit fatiguing on an already bright system. I could also imagine it just synergizing well with specific components (DACs, power supplies, amps, preamps, etc). Due to its unprecedented level of transparency, I feel there may be a place for the Atmosphere UEF Level 3 power cable in every system. 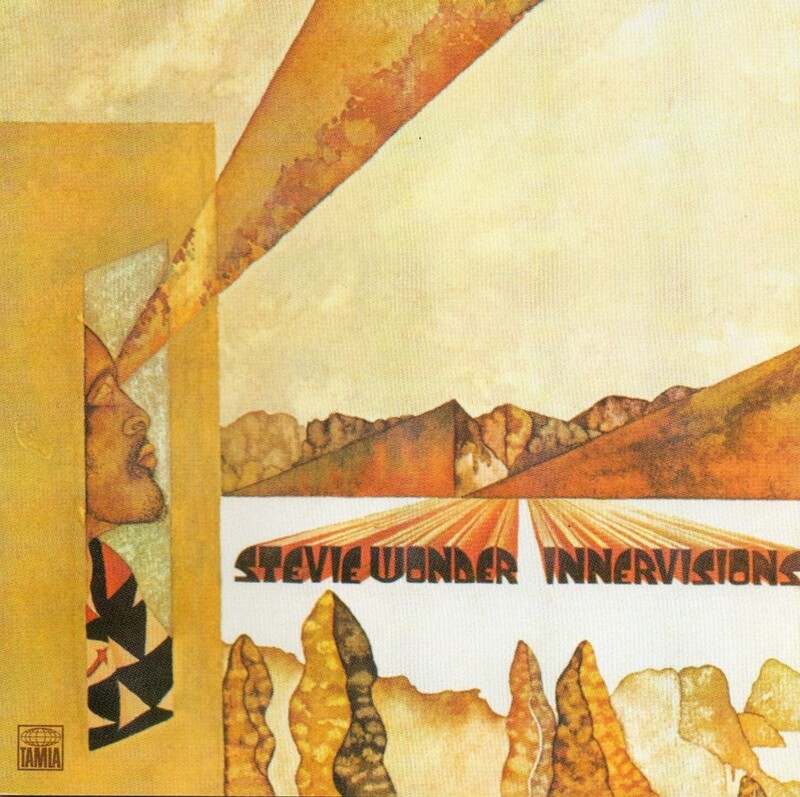 Although I prefer a warmer tone, I personally didn’t feel irritated by the lack thereof and still felt emotionally connected to the music. I believe most of the sonic benefits of the Synergistic Research Atmosphere UEF Level 3 stems from the lower noise floor provided by the extreme conductivity of the graphene. This stuff is the real deal. With other revealing cables, I found it to be “high-res” but it was almost like listening daggers flying around me. The Atmosphere Level 3 imparts a fluidness without being harsh. I believe Synergistic Research has achieved what they sought out to create: products that relay an uncorrupted signal. 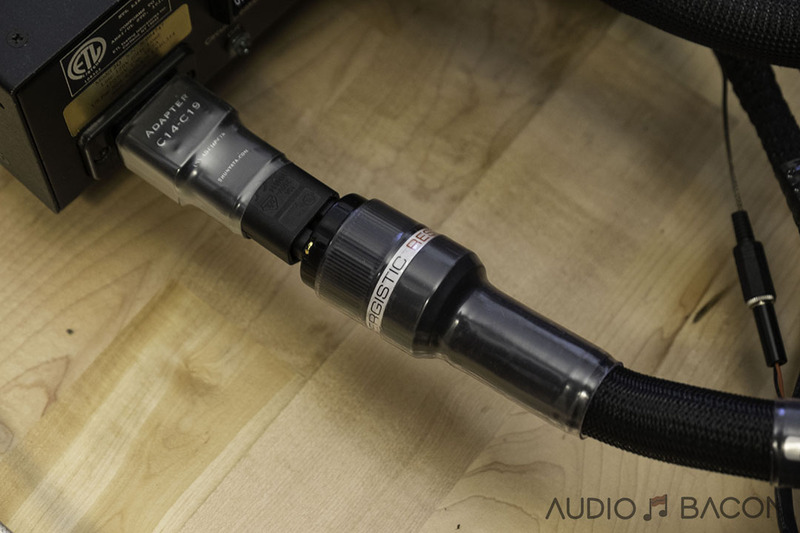 The Atmosphere UEF Level 3 power cord is the most transparent, detailed, quiet, and spacious sounding power cable I’ve ever reviewed. We’ve since replaced our long-standing Shunyata Alpha HC cable on our main system with the Atmosphere UEF Level 3 power cord and purchased another UEF Level 3 power cord for testing in other systems. As mentioned, we’ve also replaced all 22 fuses with BLACK Quantums. Our systems have never sounded this free and open and we regret not trying these products earlier. With a 30-day money back guarantee, it’s a no-brainer. With Ted Denney at the helm of Synergistic Research’s visionary endeavors, they’ll continue to push the dynamic envelope and disrupt the realm of audio. I have a feeling they’ll be making the Finest Cuts more than a few times. NextRocky Mountain Audio Festival 2017 – We’ll Be There! 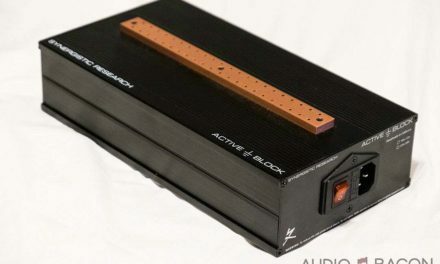 Once I get my Vitus RS-100 amplifier fixed, I’ll be dedicated to buying into the Synergistic Research brand (the only piece I own at the moment are the Element Tungsten speaker cables). 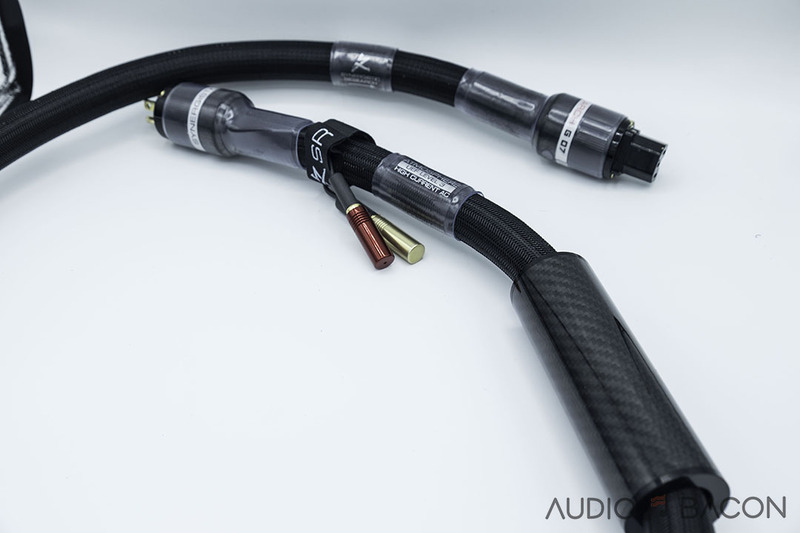 Firstly there are several companies that are comparable to the dynamics that Synergistic Research offers such as Audioquest, ZenSati & Goebel plus the Siltech brands, however they settle into a much higher price point in comparison to SR.
SR reflect an outstanding price point after the Tesla series (those were on par at retail with cables from those other companies mentioned). 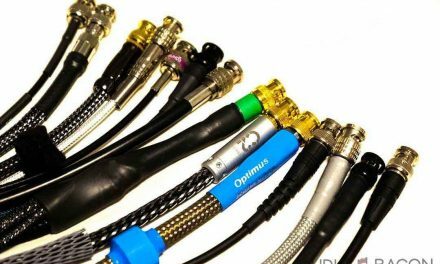 Ted Denney has made his cables so much in reach of the average working joe that dreams of having the finest cables into their Hi-End systems. I’m a big fan of Teds and can only wish him the best in all his future endeavours . Ted is the prince of stellar affordable System sonics at it’s finest.